Founded in 1986, thanks to the experience and passion of Roberto Trabucco, TRABUCCO FISHING DIFFUSION is a trade leader since the very first year of business for quality and product assortment. The well known competition match fishing rods, deadly groundbaits, unrivalled quality lines, accuracy and technical solution on floats, makes TRABUCCO FISHING DIFFUSION one of the most recognized brand in the European market. Research and development of new product can rely on the experience of the "Champion", making possible to produce new items with unique features, wich are extremely important for the growth of the company. 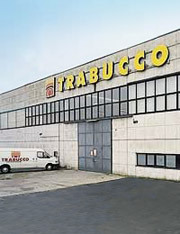 New 2500sqm warehouse, experienced and motivated staff for product development and marketing strategy, firm philosophy allways closer to competition angler and to sport angler, accurate research for the most innovative and specific need of modern angler are the features of TRABUCCO FISHING DIFFUSION company, to satisfy the request of any specific market.